Nostradamus Predictions of a Serious Fire Danger in Brasil. I am psychic John Le Sainte. Nostradamus is my spiritual guide to prophecy. Since the True Soul of Nostradamus began to visit my dreams in 2003, I have written over 1,000 new Prophecies, which I share with you today. I had previously posted this psychic prediction of a deadly Night Club fire in Rio De Janeiro Brazil Brasil and have been asked to give addition details of the psychic vision shown to me by the true Soul of the Great Seer and Astrologer Nostradamus. I can very recall many details of this terrible fire tragedy as if I was living it today. Night of Concert and Celebration. I saw this psychic vision in Early 2004 and had a feeling that it will occur around 2009-2010. When The Soul of Nostradamus leads me into the future, the psychic visions are difficult to date precisely unless there is a sign, newspaper or calender in plain sight. I could see banners that clearly had the word Mayo, but I don't believe that it was the Cinco de Mayo celebrations we have in North America. 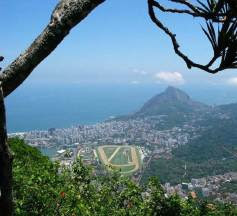 The date of this celebration in Rio De Janeiro Brasil Brazil, may have been May first instead. The nightclub is VERY full with customers, mostly a young crowd around 25-30 years old. A television crew was broadcasting an event from the club. There are extra tables and chairs set up along side a dance floor filled with people dancing. In my Premonition as shown by Nostradamus, a man is seated at a table with two woman and an empty chair. It's very dark, with loud music and much dancing. The man reaches for a drink and knocks it over backwards on the table. The alcohol spills and runs down a shiny decorative cloth banner for the celebration. As the man reaches for the drink, the lit cigarette in his hand touches the banner and it begins to burn very quickly. The banner material and decorations are VERY flammable with the alcohol splashed onto cloth, and the fire covers the wall in seconds. The crowd now rushes for the exits. One obvious exit is blocked by sound equipment . The crowd gets panicked. There are two other ways out. This club must be on a second floor as it requires descending a staircase to exit, it may be in a Rio De Janeiro Brasil Brazil Hotel. The back escape has a single width door and a narrow staircase, As the people try to exit that way, people begin to fall down the stairs and the pile of people grows so great people are crushed to death as others are now trapped by the pile. The front exit which is double width has the same problem as people fall and are trampled to death, particularly woman wearing high heel shoes. Some of the trapped and escaping people shoot video of the tragedy as it's happening. One very tragic part of this Nostradamus psychic prediction of the future is that for several days the Television stations and Newspapers show a picture of a very beautiful young woman about 23 years old that died by trampling but remained unidentified. She is so beautiful and looks like she is sleeping in the pictures. I'm hoping that this disaster may be stopped and never happen. I believe that the Citizens of Rio De Janeiro might recognize the description of the Nightclub and perhaps the day and why they would have been celebrating. I'm hoping that my vision and description of the exits of the club and the decorations used that night and stop this disaster from happening. I have been shown many other events that are going to happen in Brazil, Brasil. I'll post a few new predictions as shown to me, John Le Sainte, by the Great Nostradamus, each day for various countries around the world. Nostradamus Predictions for the Nuclear Attack on the World by Terrorists Prophecy by Nostradamus and Psychic John Le Sainte. 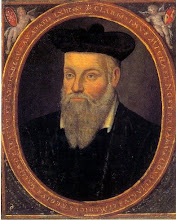 Nostradamus Predictions of World War 3 Three by Nostradamus and Psychic John Le Sainte. Nostradamus Prediction and Prophecy of a Royal Prince Assassination by Astrologer Nostradamus and his Heir, John Le Sainte, please click here. Night of Concert and Celebration. Celebration Concert e de noite. Great Fire, Death, Conflagration. Great Fire, Death, conflagração. Eu vi essa visão no início de 2004 e teve a sensação de que ele irá ocorrer em torno de 2009-2010. Quando a alma de Nostradamus que me leva para o futuro, as visões são difíceis de data precisamente a menos que haja um sinal, jornal ou a agenda de maneira clara visão. Eu podia ver claramente banners que teve a palavra Mayo, mas não creio que era o Cinco de Mayo celebrações que temos na América do Norte. A data desta festa no Rio de Janeiro Brasil Brasil, pode ter sido maio primeira vez.